Tile is supposed to be the easiest solution in terms of maintenance. Carpets hold moisture which is hard to clean. But tile, on the other hand, pools liquid for easy cleanup. But, over time, tile grout may start to change color due to mold, mildew, dirt, and stains. And, when this happens, you’re faced with a few different options. Before choosing, weigh out your options to choose the best tile grout decision for your home and family. Is Cleaning the Best Tile Grout Solution for Me? Cleaning your grout is most definitely the most cost-effective method to maintaining your grout. But, it isn’t the best tile grout solution in terms of health safety and time. Cleaning grout often takes many hours of bent-over scrubbing with dangerous chemicals. So, if this is the option you want to go with, make sure you are prepared to spend time on the floor and deal with cleaning solutions. Unless you choose to use less hazardous chemicals, utilize safety equipment like gloves, eyewear, and face mask. This way, you’ll be protected from the effects of chlorine bleach, ammonia, or other toxic cleaning solutions. Along with chemical protection, make sure you protect yourself from strains. A great solution is to invest in knee pads. This way, instead of bending over, you can rest comfortably on your knees while cleaning your grout. If you want to clean grout yourself, you can either find grout cleaning utensils at your local hardware store. But, a less expensive option is to use an old toothbrush you’ve stored around the house! Because cleaning grout may cost more time or energy than you’re willing to spend, you can always consider a floor cleaning service. With this option, you can sit back and relax while your floors get the cleaning they need. Is Sealing the Best Tile Grout Option for Me? If you go with the option to clean your floor, you may be underwhelmed when you realize that they get dirty again faster than you’d like. No one has all the time in the world to clean their grout every other month. So, if you do decide to clean your floors and want them to stay cleaner longer, sealing may be a good option for you. Sealant helps to protect grout in its current condition. It’s a clear, rubber-like solution that is applied over the grout and dries to offer the protection your grout needs from dirt and moisture. A sealant is relatively easy to apply and it’s not very expensive. So, you can buy it and apply yourself if you decide to clean the grout on your own. Otherwise, if you’ve hired a grout cleaning service, you can ask them about the cost to add sealant. Is Regrouting the Best Tile Grout Solution for My Home? Unless there is damage or you want to change the color of your grout completely, you’ll most likely not need to re-grout. But, if you’re sure it’s something you want to do, make sure you use some precautions first. 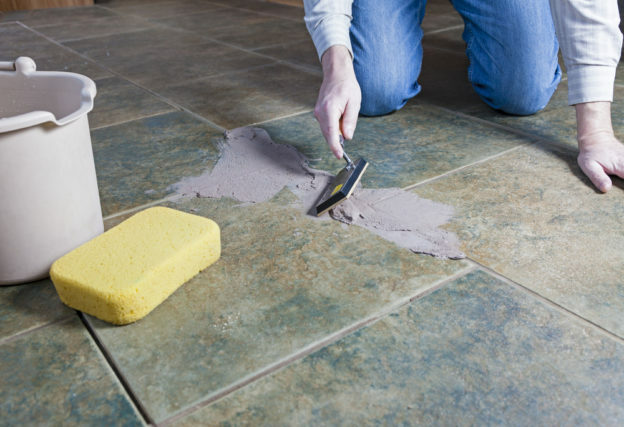 If you wish to regrout due to mold or mildew, before doing so, you may want to determine that the mold is only on the outer surface of your tile. If it’s underneath, you may need to have the fungus killed and cleaned away before re-tiling and regrouting. Additionally, check your tiles for underneath water damage (if your tile is on the wall like in a shower) by listening to hollow areas and checking for any cracked tiles. Is Reflooring Altogether the Best Option? If you’re still going to hate your grout after a good cleaning or even a regrout, you may need to switch up your flooring altogether. Instead of tile, maybe you want wood floors or carpeting. Whatever your desires, there is a flooring option out there that meets your wants and needs. But, before you can have your new floors installed, you need your tiling and grout removed. Let the professionals of Dustbusters Floor Removal help! We’ll even tow away all of your old flooring materials for you and leave your home cleaner than we found it! To get a free quote for tile floor removal, give us a call today at 866-883-8783.